Mae’n ddrwg gen i, mae’r cofnod hwn dim ond ar gael mewn Saesneg Prydain. For the sake of viewer convenience, the content is shown below in the alternative language. You may click the link to switch the active language. By working with the body, movement and physical contact, parents and children develop a new, physical form of communication, which is enjoyable for both; children enhance and improve their motor skills and self-confidence and parents develop a sense of trust in their child and themselves. We will begin with a 1 hour Contakids session and then move into a facilitated jam. Ideally participants will be one-one (one parent per child) with children aged 2-5 years. However, Zosia is willing to be flexible and welcome slightly younger, or slightly older children (up to age 8) and larger families. Open to parents who are makers, movers or artists of any kind. 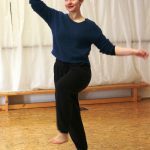 You don’t need to be a trained dancer or to have done Contact Improvisation before. Anyone can enjoy a Contakids session!